Natural Born Learners : Why Don't Students Like School? Why don't students like school? Seriously? You'd think with a title like this, you're in for some juicy reading from a person who understands the kid's point of view. But don't judge a book by its title. The author Daniel Willingham, a cognitive scientist is well meaning but falls short of the mark. According to the research he quotes, humans might be curious but we don't like to think. Why? because it's hard. And this basically is the reasoning behind why students don't like school. So the point of the book? It serves as a heavy duty 'how to' handbook for teachers and educators to give them tips on how to get their students to enjoy learning (since according to him, we humans avoid using our brains at all cost); to create, like a magician might, opportunities to "feel the rush" of a discovery more often. It basically asks of teachers that they try to make schools "not a place of boredom and drudgery" but excitement and discovery (38). Willingham says people need background knowledge in order to think critically but he also says "It's better to have a smattering of knowledge than no knowledge."(35). I'm not so sure. A little knowledge is a dangerous thing, or so the saying goes. To me, it seems absurd to first carve out specific places of learning and then proceed to create these expectations. What an incredible tall order to deliver. To have to take on such a responsibility seems daunting, unfair and even presumptuous. Frankly if I were a teacher I would want to give up. If you're authentically excited about something then that automatically generates enthusiasm in those others who resonant with what you're into-it will still do nothing for those who aren't interested. Taking offense at the 'bright lights' that have 'denigrated school" the author simply fails to see the obvious; that the 'background' knowledge he insists develops critical thinking was an interference for these thinkers who wanted instead to pursue what they were passionate about. Background knowledge comes after-as a result of following your interest and building on that solid foundation. The book has merit only insofar as a platform in which to once more expose schooling strategies as fundamentally intrusive. Teaching is an act of persuasion he says. And that to me says it all. 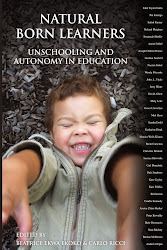 Labels: Book Review, why don't students like school? @rfs-teachers do their best and if this is a handbook that can help them to help stimulate their students-what is wrong with that? I've heard of this book before. Peter Gray mentions it in his September 2, 2009 PT blog post (which won't open!!) titled ""Why Don't Students Like School?" Well, Duhhhh..."
The only part I can access is the snippet"
"Someone recently referred me to a book that they thought I'd like. 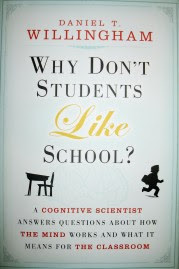 It's a 2009 book, aimed toward teachers of grades K through 12, titled "Why Don't Students Like School?" It's by a cognitive scientist named Daniel T. Willingham, and it has received rave reviews by countless people involved in the school system. Google the title and author and you'll find pages and pages of doting reviews and nobody pointing out that the book totally and utterly fails to answer the question posed by its title. ... Everyone knows the real reason why students don't like school, but most people, including Willingham, avoid mentioning it. School is prison." @Rebecca-thanks! The author completely skirts around the issue-the real reason kids don't like school. As you say-it's a prison for most kids. I loved this book, actually. Also excellent and along the same lines is "The Art Of Changing The Brain." I think he does answer the question why students don't like school, just from a cognitive biological standpoint, not a sociological standpoint. Rather than criticizing him for not repeating the "school is prison" mantra, perhaps one would consider this neurobiological support for the "one size does not fit all" claim. One of the main take aways is that students don't like school because learning is a highly individual, biological process. His theory is that all learning is a physical change in the brain, and therefore must start from the current state of the brain. How can a teacher, let alone a school system, possibly accomodate that with any degree of effectiveness? He emphasizes that as a professor of introductory courses in university, he falsely assumed that his students were a "blank slate." What he realized is that students have all kinds of preconceived notions about gravity, magnetism etc. even if they've never taken a physics class before. And, since all of these ideas are physical pathways in the brain, the wrong ones have to be replaced before you can hope for the right ideas to replace them. To relate this to why kids don't like school, it's because professors/teachers spew information then can't figure out why students don't get it. It's because there's not usually the opportunity to figure out what they DO know (or believe, right or wrong) first and to address the physical traces of those beliefs before moving on. In fairness to the author, he's a cognitive scientist. It would make sense that he views the ills of the school system through the workings of the brain. This is more evidence against institutionalized learning, just not the kind you're used to hearing. If learning is a highly individual process than obviously schooling will never satisfy-and it follows that it is the schooling that must change-not the teachers trying to change students. @rfs - I don't have the book handy as I'm on the road, so I can't look up specifics. But I will present one possibility: many of us have been told not to criticize an idea *unless you have an alternative solution. * I would submit that its entirely possible, being a cognitive scientist that stumbled into the education world, that he might not presume to demand the dismantling of the entire educational system when he doesn't have a better idea to replace it. What he can contribute is his specific, scientific knowledge about the goings on of students' brains, then let readers decide how to use that knowledge. Especially if, as the first commenter reminded us, his intended audience is actually practicing teachers. I know all of us here are in agreement that the system needs to change to be useful. But, if one puts oneself in the position of a teacher trying to get through a day job reaching students, then it's easy to see how this book can be a resource, from a very specific direction, to help improve the quality of their teaching. I may be nit picking here, but I really don't think it was the author's responsibility in this book to explain what's wrong with the system. Authors write what they know, for a particular audience. And, if you're going to start criticizing the system, then as an author you really have to have something of your own to say about it. You either need facts/stats to present or your own argument. And that requires that you have considered deeply the topic at hand. If this guy isn't an anti-school/organizational change kind of guy, then why would the broader topics be in his book? My husband is a published author in the software industry. Every now and then he'll receive a criticism not for something he did write, but for something he didn't write. His response is always the same: that's not what this book is about. So maybe I'm just a little sensitive, but maybe that's just not what this book is about, and that's OK. :) We can still learn from it.